Strange to see you here. Sometimes, your memory of something is so different than the actual thing that your faulty memory distorts the original, making what once was familiar into something strange. This is the vertigo that I felt while watching this movie, which is a sequel really just in name to Ang Lee’s film from 2000. Characters and types and plot events are repeated, but in ways that feel inert, and the best parts of the movie are when it doesn’t bind itself to the path of its precursor. The movie is also making headlines as Netflix’s second feature film release, and is currently playing in limited release and on Netflix’s streaming service. Full disclosure: I watched it at home mostly because the closest theater playing it was still pretty far away. The plot opens with the introduction of a familiar face, Shu Lien, played by Michelle Yeoh, as her caravan gets ambushed by warriors from a group led by the curiously named Hades Dai (Jason Scott Lee), the villain who is trying to rule the entire “martial world.” The attack on Shu Lien is part of an effort by the villains to capture the Green Destiny, the famous sword once wielded by Li Mu Bai (Chow Yun-fat’s monk character from the previous movie). With this sword, and its accompanying aura of invincibility, Hades Dai and his followers would be unbeatable, and Shu Lien and her allies try to keep the sword out of his reach. The action sequences, with a few exceptions, are not overly original, but solid, as one would expect from a movie directed by the ubiquitous Yuen Woo-ping. The trademark floating wirework is present, although the action itself is paced much more briskly, the fights more emphatic exclamations than languid meditations. 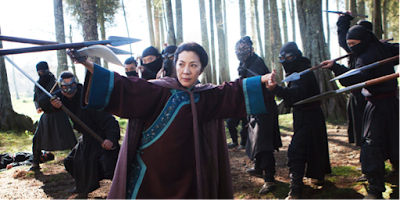 Yeoh and Donnie Yen, actors both in their 50s, acquit themselves well, the action hardly seeming to be beyond their ability, and as usual, whenever either of them shows up in a scene, they make everything better. There is definitely some CG-enhancement throughout the film, but never to the point of taking me out of the film, and I would say under the average amount of CG visual effects one can expect in a wushu film from the last decade. The best fight of the film involves this tactful use of CG, involving Donnie Yen’s character, his opponent, and a frozen lake. The use of CG is something most modern martial arts have gotten used to in their movies, if not totally accepting it. The CG action enhancement is the least of my concerns, however. Perhaps due in part to the CG effects, the color palette felt oversaturated, especially in the weird blue hue and brighter colors that digitally photographed movies take on. 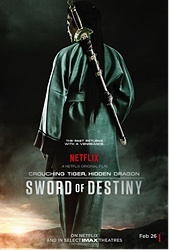 A bright color palette could actually work in distancing this story from the original, and paying homage to the fantastical comic books that are the basis for the Crouching Tiger, Hidden Dragon movies, but then it also pulls the story away from whatever universe the first movie was a part of. This pattern of taking away from its predecessor continues in the repetition of scenes and plot points. I tried to treat this movie as its own independent creation and take it on its own merit, but that becomes a nearly impossible task when the movie insists on repeating the beats from the other one. We get a break-in to try and steal the Green Destiny. We get Shu Lien intrigued by a young, impetuous female. We see two young warriors who hate/love each other. We see Shu Lien trying to reconcile with a repressed part of her past. I understand playing upon the nostalgia of the fans of the first movie, but the exact repetition feels lazy, not connected to some greater thematic cycle. Also, I don’t enjoy saying it, but the sword looks a bit silly. And this is not to say that the production design was poor overall, which it certainly was not. Hades Dai’s villain sword looks heavy and menacing and powerful. The masks that his White Lotus clan wears are creative. Why make the Green Destiny, which is the central Macguffin/its own character/single most powerful force in the movie, look so plastic? If the story has progressed 18 years further from the previous movie, why would there be pieces added to it? Maybe I’d be more forgiving if the added pieces didn’t look like Legos. I’m also curious about the choice to have the story acted in English, rather than Mandarin. 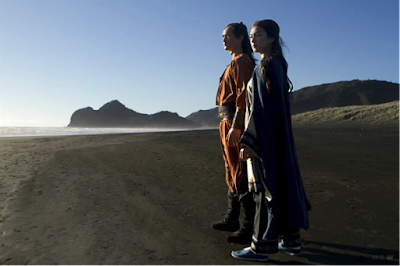 This is clearly a marketing ploy to make the movie more palatable to Western audiences, but to have clearly Asian actors dressed in native cultural attire, set in a specifically Asian although fantastical setting, and then still speak in English feels strange and tends to pull me out of the movie. It reminds me of whenever they use hip-hop in the score for a movie that is clearly not set when hip-hop existed. But, I could see how this would bother me more than others, so I’m curious to see how the reaction pans out. The best parts of the movie, as mentioned before, are when it breaks away from the confines of the prior story, or at least expands upon it. 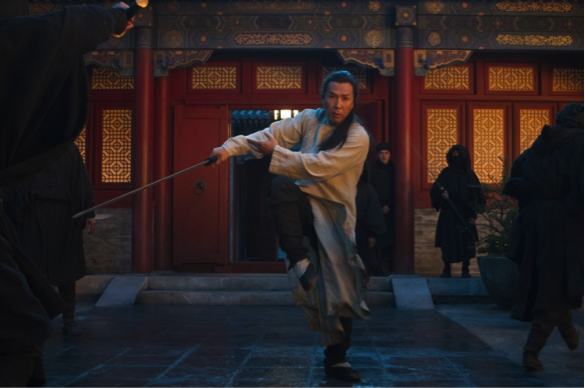 Donnie Yen plays a character named Silent Wolf, who comes to protect the Green Destiny, and recruits a ragtag group of martial artists, all with different styles and weapons expertise. This group expands the scope of the story to not just include bigger fight sequences, but also change the normally dour tone of the story to something more lighthearted and convivial. 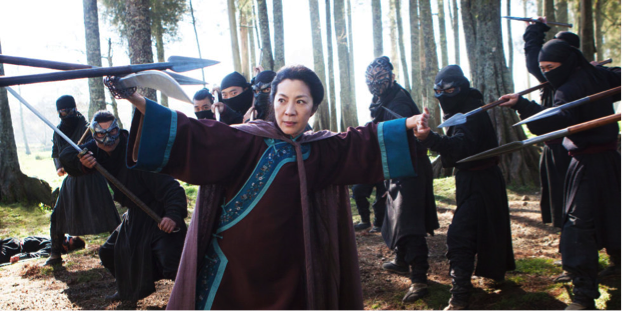 Surely not everyone is brooding upon revenge in the martial world, and Silent Wolf’s band of misfits embraces that the most. Like a lot of other sequels, the movie would have managed expectations a lot better without a tie to a previously existing universe. I think it can stand on its own as an ok martial arts movie; the added baggage of a highly acclaimed precursor only makes this seem more slight than it actually is.